Eugene Savage (American, 1883–1978). 'Aloha …The Universal Word,' 1940. Oil on canvas. Collection Matson. Eugene Savage (American, 1883–1978). 'Hawaii's Decisive Hour,' 1940. Oil on canvas. Collection Matson. 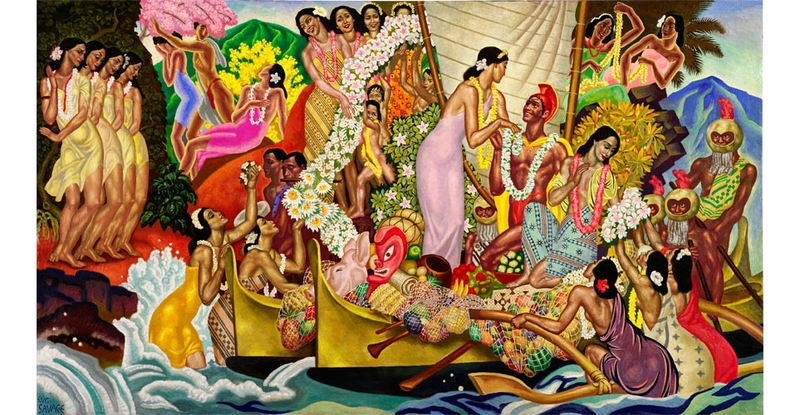 In 1938, Matson commissioned the American painter Eugene Savage to create six Hawai‘i-themed murals. 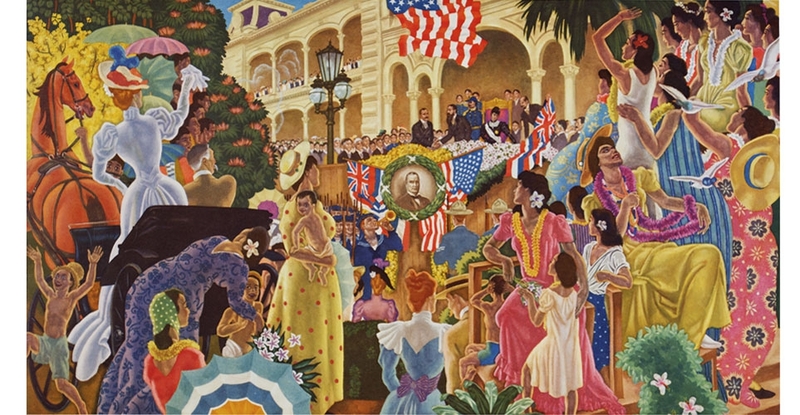 Monumental in scale, designed to inspire, and no doubt intended for public display, these paintings had never been exhibited publicly until Art Deco Hawai‘i, a landmark exhibition organized by the Honolulu Museum of Art in 2014. Instead, upon their completion, with the advent of World War II, the works were placed immediately into storage. After the Armistice, Matson used reproductions of the paintings as covers for the collectible menus on its Honolulu-bound liner, the S.S. Lurline, while the actual paintings remained hidden from view. Savage was academically trained and a seasoned painter of murals, and his commissioned work includes paintings for municipal buildings throughout the United States. For his Hawai‘i project, he traveled from his teaching post at Yale University to spend three months in Honolulu researching and sketching artifacts, botany, topography, and received histories to master the particularities of the islands’ atmosphere and visual culture. The murals reflect the artist’s careful investigation: meticulously executed and intricately layered, they reference the art, objects, flora, and fauna that he no doubt encountered in area museums and botanical gardens. But far from documenting Hawai‘i’s indigenous art and customs, Savage used all he absorbed as a set of props in an elaborate visual narrative that articulates, embellishes, and reimagines life in the islands as a celebratory spectacle of color, pattern, and movement. His fantasy portrayal of historic and local tropical culture was mirrored in the hospitality, allure, and entertainment value of the contemporary island experience. By romanticizing perceptions of Hawai‘i’s timeless exoticism and natural beauty in stylish, boldly decorative, and inescapably Art Deco terms, the murals served the tourism industry in its ambition to promote Hawai‘i as a paradise on earth. Because of the murals’ immense popularity as part of Art Deco Hawai‘i, Matson has generously agreed to allow the museum to continue to display them.